This article presents lists of the literary events and publications in 1762. The Sorbonne library is founded. The Académie française produces a new edition of its dictionary of the French language. In Paris, the Comédie-Italienne is merged with the Opéra-Comique and performs at the Hôtel de Bourgogne (theatre). Benjamin Victor's adaptation of The Two Gentlemen of Verona (with expanded roles for the clown Launce and his dog) is staged by David Garrick at Drury Lane, and runs for five nights. It is the earliest known performance of that Shakespearean play in any form. Christoph Martin Wieland begins publishing his prose translations of 22 Shakespearean plays, the first translations of them into German (in 8 volumes, through 1766). Rev. Hugh Blair is appointed first Professor of Rhetoric and Belles Lettres at the University of Edinburgh by King George III, the first such chair in English literature. 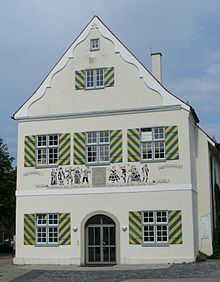 Komödienhaus in der Schlachtmetzig in Biberach an der Riss where in 1762 Shakespeare's The Tempest, translated by Christoph Wieland, is performed for the first time in Germany. ^ Stam, David H. (2001). International Dictionary of Library Histories, Volume 2. Chicago, IL: Fitzroy Dearborn Publishers. p. 880. ISBN 1579582443.